Connect the Dots | Van Nuys brings neighbors together with cyclists and designers to reimagine Van Nuys Boulevard at its fullest potential, solving our city's transit, public space, and water-supply needs. The Los Angeles streetscape must shift from impervious, carbon-intensive, and auto-centric to a diversified, low-carbon, and performative public domain to meet the challenges of the 21st century. Beginning with a series of free public design workshops, Connect the Dots will support the city in addressing unparalleled water challenges by inviting Angelenos to help solve our city’s water, transit, and public space needs. Connect the Dots will provide the tools for citizens to reimagine LA’s Great Streets performing at their fullest potential: serving as engaging public spaces; healthy, active transit corridors in lively economic zones; and strategic groundwater recharge assets. Connect the Dots will combine data from hydrologic research, public art, community dialog and citizen cyclist-scientists to collaboratively shape a shared vision. The shift from dependence on expensive, dwindling, and carbon-intensive imports to local, carbon-free groundwater replenishment through stormwater capture will accelerate Los Angeles’s transition to water security and climate resilience. • prepare and present synthesis proposals for long term change. Local college students and community members will work together to prepare and deliver three public design workshops/bicycle festivals in January 2016. Connect the Dots partners will work to reveal, reimagine, and realize an integrated vision for Van Nuys Boulevard. Residents will collaborate with design teams and bicycle advocates to integrate pedestrian and bike-friendly street features with best management practices for infiltration and capture of stormwater along street edges, bike lanes, medians, and adjacent open spaces. Arid Lands Institute designers will deliver data and design objectives of the workshops. Pacoima Beautiful will run focus groups and facilitate workshops. LA County Bicycle Coalition will serve as expert advocates for mobility and access. Post-workshop, ALI will coordinate analysis and synthesis of community input and generate written and visual design and policy recommendations. Graduate teams will present draft presentations for review by partners and stakeholders before submitting final recommendations to the Great Streets Initiative in April. Los Angeles is in the process of making massive investments of capital, labor, and technology into its street infrastructure, shifting from a carbon-intensive, auto-centric 20th -century streetscape to a diversified, low-carbon public domain for the 21st century and beyond. Connect the Dots leverages that investment to support the city by simultaneously addressing unparalleled water challenges. How can we leverage street investments to diversify our water supply sources, shifting from dependence on expensive, dwindling, and carbon-intensive imports to local, carbon-free groundwater replenishment through stormwater capture? No street that ignores stormwater capture is truly a Great Street in a dry land. At the same time, blanketing the San Fernando Valley with generic ‘best practices’ may be well-intentioned, but will not attain optimal functioning of LA’s groundwater basins. Due to differences in soils, land uses, and contamination levels, some places are better for infiltration than others. The data contained within ALI’s high-resolution hydrologic research is not generic: it is site-specific, accurate to 900 square feet. It contains the particular hidden ‘rules’ for where to infiltrate and where not to infiltrate; a hidden ‘code’ specific to Van Nuys Boulevard (and every other street in the basin). A street that celebrates high-precision stormwater capture as a driver of great public space, cooler urban environments, safe bikeways and sidewalks is not only more pleasant, attractive, and economically viable—it will accelerate Los Angeles’s transition to water security and climate resilience. Connect the Dots supports the City of Los Angeles in reaching these goals by integrating stormwater capture with transit alternatives for a low-carbon future and a robust local economy. The Van Nuys community can take pride in piloting and leading this process designed to take root on streets across the city. Connect the Dots | Pacoima was a huge Success! Thank you all who participated in our recent workshop in Pacoima! It was the first small test, so much more to come in Van Nuys! Buys chalk for students to draw unseen water systems below, on the street surface! Supports a cyclist collecting data on water systems and bike friendly streets! Buys a tree that will help us envision how the street could change and then be donated to a local family. 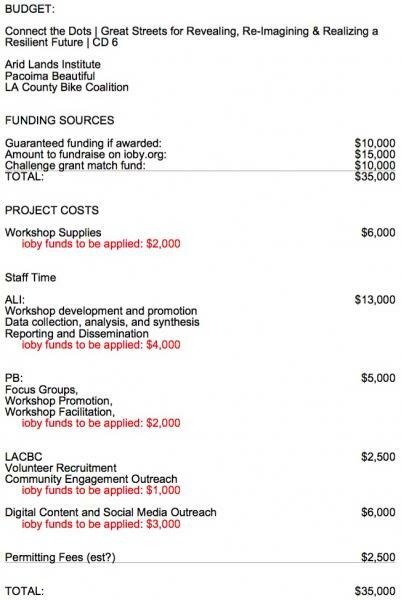 Funds a student design proposal for Van Nuys! Funds a CtD Design Festival that creates new visions unfolding in real time for resilient streets!